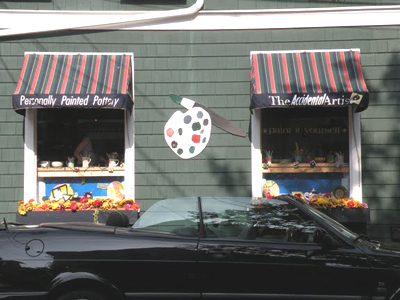 Beaches, Parks, Sailing and the Newport Creamery! Wondering what kids activities we have here? Newport Rhode Island isn't just a destination for adults. There are plenty of things to do in Newport for children as well. In addition to the history, scenery and the Newport Mansions, the "City by the Sea" will keep your children entertained for the entire summer with its many parks, beaches, eateries and arcade. Use the Kids Activities map below to find your way to the many great places you can take your kids while you're here. Click on each placemark, and zoom in for more detail. 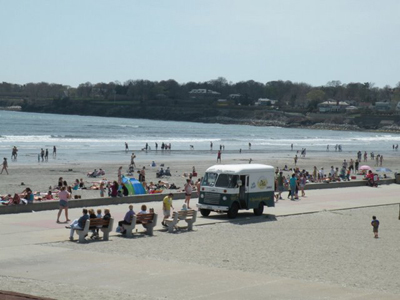 One of the most popular kids activities in Newport is the beach. 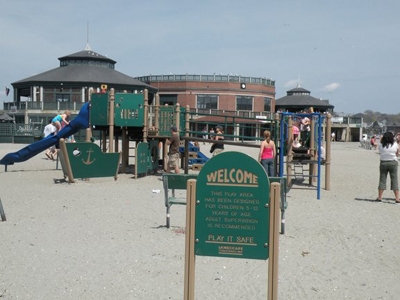 There are many Newport RI beaches, but the one offering the most for children is Easton's Beach (1st Beach to the locals). In addition to the beach, some of the other most popular kids activities in Newport are: surfing, scuba diving, kayaking and jet-skiing. Two of the best places to check out if you're into water sports are Adventure Watersports on Long Wharf and Water Bros. surf and skate shop on Memorial Boulevard. Newport is a great city to visit if you're into water sports, especially surfing and skating. 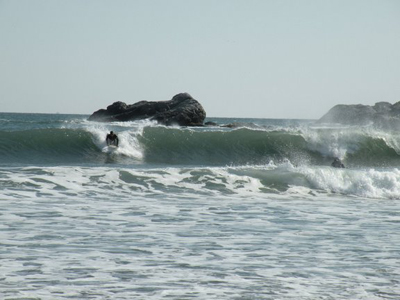 You can surf at 1st and 2nd beaches, but 2nd usually has better waves. Rent boats, kayaks, and jet-skiis here. Surfboards, skate boards and apparel. 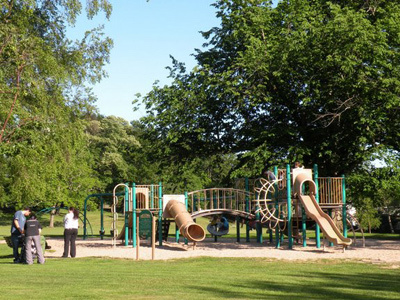 There are many great parks in Newport that your kids will enjoy. Check out the map above to get directions to them. Which park is the best depends on what you want to do. 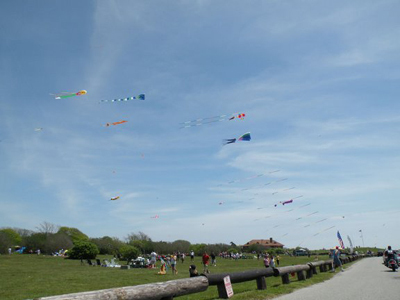 If you're into kite-flying, then Brenton Park around the Ocean Drive is where you want to go. This park has the best ocean views because of its location at the southern tip of Aquidneck Island. It has plenty of room to throw a frisbee or football, and has many picnic tables and restroom facilities. You could easily spend the whole day here. King Park, on Wellington Avenue is just a couple of blocks from Thames Street in the downtown area. 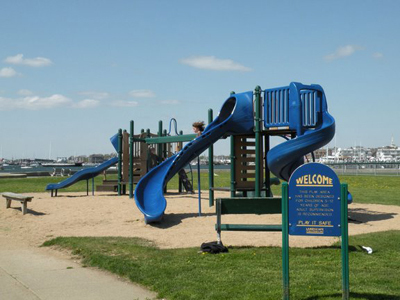 This park has stunning views of Newport Harbor, a playground and a baseball field. You may even witness a wedding ceremony being held under the gazebo there. If you go all the way down Thames Street and take a left on Morton Avenue, you'll find Morton Park 2 blocks ahead on your right. This park is great for young children because of its playground. It also has plenty of room for older kids to run around, throw a frisbee or play some volleyball. If you're lucky enough to be here during a winter snow storm, this is the park you want to come to. The big hill on the south side of the park (the locals call it "Suicide Hill", but its not that bad) is great for sledding. As long as you accompany them, a child could sled down this hill. If your child is interested in sailing, there's no better place in the world to learn than the "Sailing Capital of America", Newport Rhode Island! Sail Newport, located at historic Fort Adams, is the perfect place for your child's sailing education to begin. This organization offers personalized training to new sailors, whether you're 6 or 60 years old. 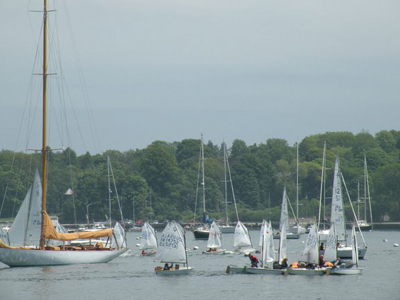 They offer Youth and Adult sailing instruction, summer sailing camps and Regattas where new sailors can test their skills. Be sure to check out the Museum of Yachting (just past Sail Newport) while you're there. Although Newport is best known for sailing, it has a great history in other sports as well. Newport is home to the International Tennis Hall of Fame and historic Cardines Field (home of the Newport Gulls and the Sunset League). 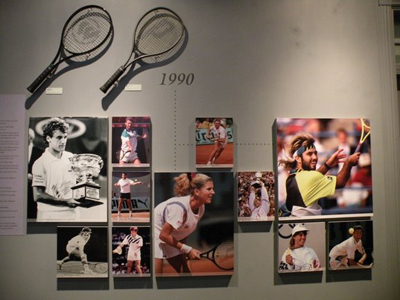 If your child wants to learn about the history of tennis, or even play a few sets on their grass courts, then take them to the Tennis Hall of Fame on Bellevue Avenue. Just give them a call first to make reservations at 800-457-1144. If you and your kids are into baseball, then you're in for a real treat! During the summer, you're likely to find a game being played at historic Cardines Field on most nights. 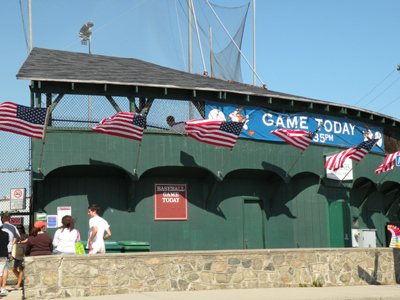 One of the oldest baseball parks in the nation, Cardines Field is now home to the Newport Gulls (of the New England Collegiate Baseball League) and the Sunset League (started in 1919). The Sunset League is the oldest continuous amateur baseball league in the nation. This is an incredible place to watch and play a baseball game. I've been lucky enough to both watch and play in many games on this historic field. I played here for both the Babe Ruth League (13-15 years old) and Rogers High School's team. I can't say enough about how cool this park is! You should definitely check it out if you have a chance. Just in case your kids aren't interested in wearing a jacket and tie, and dining at the White Horse Tavern, I thought I'd mention a few of my favorite childhood places to eat. 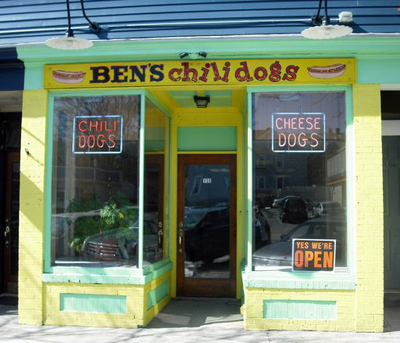 Come to think of it, I would still rather go to Ben's Chili Dogs and get a few chili, cheese and onion dogs than go to the finest restaurants in Newport. Ben's Chili Dogs - The best lunch on Broadway! Ben doesn't accept credit cards, so bring cash! And there is only seating for about 12 inside. If you're going to go during the lunch rush, you'll have to take it to go. Ben's is located at 158 Broadway. The phone # is 401-846-8206. 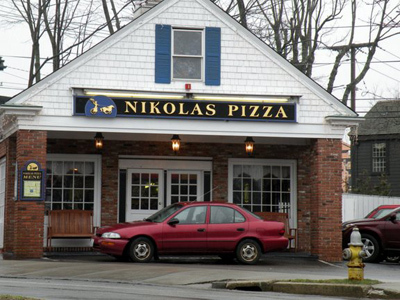 Nikolas Pizza is another place that I loved growing up, and still enjoy to this day. The pizza is pretty good, and I've always been in heaven dunking their good sized wings in bleu cheese! 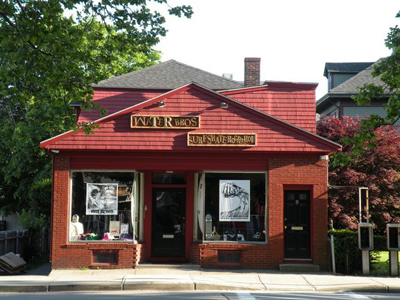 Nikolas is located downtown, between Bellevue Avenue and Spring Street, at 38 Memorial Blvd West. You can sit down and eat inside (and play their Pac Man video game) or you can have a pie delivered by calling them at 401-849-6611. There are many other kids activities if you're still looking for something to do. Just about every kid loves the arcade at Ryan Family Amusements. The arcade is located at 268 Thames Street and is open from Noon to 9pm Sunday to Thursday, Noon to 10pm on Friday and 10am to 10pm on Saturday. 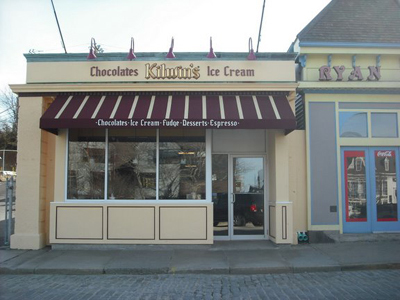 Get some chocolate at Kilwin's as you leave the arcade! Once your kids have had their fill of sweets and video games, why not educate them a little bit, but in a fun way? 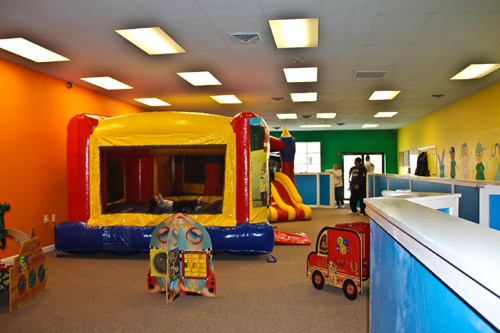 After experiencing all of Newport's great kids activities, the kids may be tired, and you may need some adult time. If that's the case and you're in need of a babysitter, check out Newport Babysitting Services. Whether you need a night out on the town, a nanny for the summer or you have an event where the kids need supervision, they can handle it. 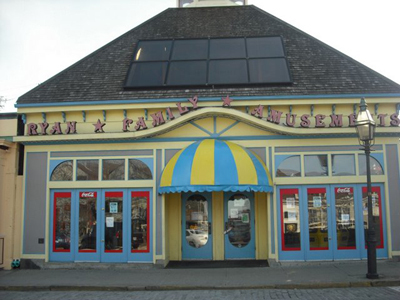 Newport Rhode Island, in addition to being fun for adults, is filled with fun kids activities as well. Those listed here should keep your kids busy for awhile. I'll continue to add fun, new kids activities to this page as I come across them. If you know of any that you think are worthy of a mention on this page, please let me know about them.